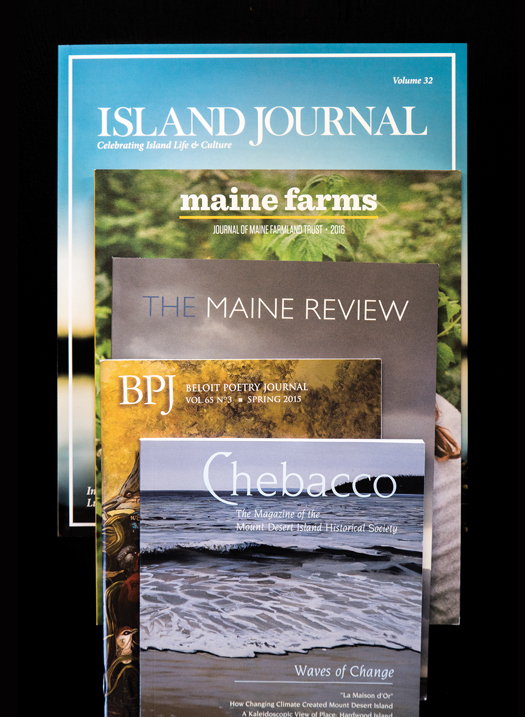 When Martha Stewart told us one of her favorite Maine reads was Chebacco, the journal of the MDI Historical Society, we took it as an excuse to shout out a few under-the-radar journals and membership mags that no Maine-o-phile should miss. First launched in 1950 at Wisconsin’s Beloit College, this storied American quarterly — an early publisher of prize-winning poets like Galway Kinnell, Charles Simic, and moved with its editors to Maine in the 1980s. Now a sleek, saddle-stitched volume, it’s never strayed from the quality and daring of its origins. Recent highlight: New work from native Mainer and Best New Poets honoree Jacques J. Rancourt. $18 annual subscription. Mount Desert Island Historical Society’s annual membership publication offers “fresh perspectives” on the history, ecology, and social fabric of Maine’s most dynamic island. Recent highlights: A detailed history of Wabanaki place names by Abbe Museum educator George Neptune; a photo essay documenting the author’s circumambulation (that’s a long, circular walk) of the island. Subscription with a $25 annual membership or $20 per issue. Recent highlight: A thoughtful profile of the UPS manager turned entrepreneur working to transform fuel delivery to Casco Bay’s island communities. $14.95 per issue or free with annual membership at the $100 level. Stories and terrific photos of Maine’s agricultural renaissance fill the handsome, matte-stock membership journal of the Maine Farmland Trust. You might spot some regular Down East writers and photographers contributing to this annual gem. Recent highlights: A sweet, sad piece of short fiction about hapless back-to-the-landers by Maine’s O. Henry Award–winning Bill Roorbach; a black-and-white photo feature documenting a child’s life on a Belgrade farm. Subscription with annual membership; member levels begin at $20. A three-year-old biannual literary journal edited by Port Clyde writer and photographer Margot Anne Kelley (former board chair of the venerable eco-lit mag Orion). Mainers predominate among the contributors, but the poetry, short stories, and essays are more linked by a sense of experimentation than by geography. Recent highlight: A series of lyrical poems by Maine poet laureate Stuart Kestenbaum, each one constructed around words provided by friends. Subscription $20 annually or $15 per issue.